The Quechua Arpenaz 10l is a 10 litre day pack that is extremely lightweight (175g / 6oz) and water repellent. The bag has one large compartment and a smaller pouch on the front. It also has two loops on each strap that are listed as “thumb loops”. I think these could also be used for ice picks or hiking sticks. You could also use them for hanging extra gear with a carabiner. I found that the loops were quite handy for using as a makeshift sternum strap. You thread the loose ends of the straps through the loops and tie them together to hold them in place. This bag is extremely affordable at less than 3 Euro. However it costs upwards of $15-20 outside of Europe, which puts it into the same price range as Sea To Summits UltraSil day bag. 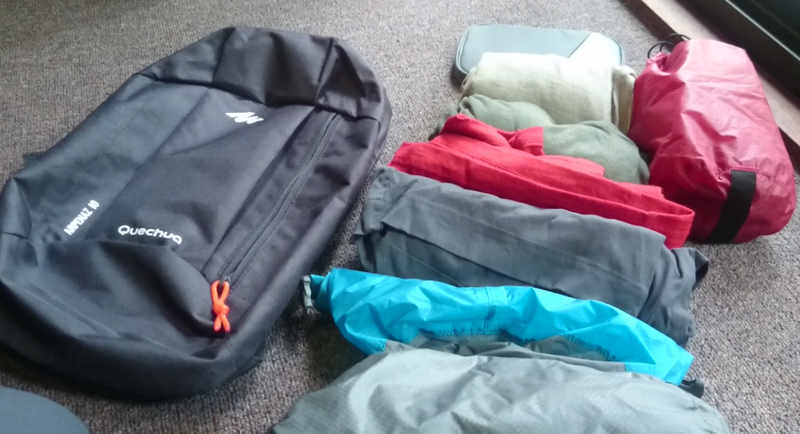 The Sea To Summit bag is also lighter, double the capacity (on paper) and packs down more compact. Yet it lacks padding or an additional pocket, and in reality is roughly the same size. The Arpenaz’s padded straps and back are quite comfortable and make wearing the bag for longer periods quite comfortable. Everything that fits into the bag. The Arpenaz 10 is marketed as a kids bag or a bag for short hikes. However I decided to see just how much I could pack into it before it became difficult to close. Turns out I was able to fit 4 rolled t-shirts, 1 rolled pair of shorts, 5 rolled underwear, 4 pairs of socks, microfiber towel and a few electronics. This is more than adequate for an ultralight backpacker around a moderate climate. Packing for winter might prove more difficult with this bag, but for a warm climate it is doable. Overall I do like this bag and it’s a great candidate for a packable day bag. It’s even something worth considering if you want to go ‘ultra light’. However it will be hard for me to choose this bag over my well worn sea to summit day bag. *Contains affiliate links which at no extra cost to you, help run this site.